During his 2½ year reign as general manager, Davis led the department through its waning years — during both good times and bad. During the troublesome months of FY 1972-73 — when the DSR faced near bankruptcy, but also during the more celebratory times — such as when the DSR celebrated its 50th Anniversary in 1972. During his early months as general manager, it wasn't unusual to find Ed Davis riding the buses and visiting terminals to "find out what's wrong." Davis demanded his department heads also "get out of their offices and ride the buses, ...and...take notes." He added downtown express service on lines such as Crosstown and Clairmount, so that passengers wouldn't have to get off and transfer to get to their downtown jobs. One innovative idea of Davis included a promotional "Ride the Bus Month" to attract more riders, which included a fare reduction from 40¢ to 25¢ between 9 a.m.and 3 p.m. from May 15 to 19 and May 22 to 24, to coincide with the DSR's 50th Anniversary on May 15, 1972. The idea being to change the public's mind about using public transit by giving the DSR a chance. It was also under Ed Davis when a new fleet of 134 GMC air-conditioned coaches arrived introducing the new DSR slogan, "Come Ride With Us!" displayed across the bus in large letters. It was also Davis at the helm in 1972, when the new $15-million DSR Administration Office complex opened at 1301 E. Warren on the city's near east side. He was also in charge during the spring of 1973, when the first female bus drivers since WW-II were hired by the DSR. At the time Davis was quoted as saying, "This is the beginning of a new DSR policy to search actively for qualified women drivers." Davis was also instrumental in promoting the first blacks as department heads in the DSR after noticing an absence of African-Americans in upper management positions. Also on Davis' agenda were plans to make adjustments on a number of DSR routes. His plans were to cut down on services in the depopulated areas of the center city, and expand services "where the people have gone," particularly in the northwest and northeast sections beyond Grand Boulevard. Davis even envisioned exclusive bus lanes on the city's freeways, with a bus a minute sailing downtown past cars stuck in traffic jams. He wanted to shout out of the bus window to those drivers — "Come and ride with us. You'll get there a lot sooner!" However, most of his ideas would have to take a back seat, as more pressing financial problems lay ahead for the DSR. With drastic cuts in service on the horizon, including the possible elimination of all Christmas and New Year's Day service, and with the immanent possibility of bankruptcy being predicted for the department, most of his ideas would never see the light of day. Perhaps the most negative mark left on Davis' reign as general manager were comments he made in March of 1972 regarding employee work performance. A letter which Davis addressed to the Board of DSR Commissioners — later released to the press — made him a marked man by the various DSR unions. In his letter Davis charged that the DSR was afflicted with high absenteeism on Mondays and Fridays, stating that, "...in many positions, in excess of 20 percent of employees habitually take Friday and Monday off." Davis also stated that the payment of phony sick claims and the high overtime necessary to cover those absences; along with "accident-prone" drivers; and an accident claims racket, all constituted major expense items for the department. Accident claims against the DSR were averaging about $100,000 a month, while unnecessary overtime was costing more than $10,000 per month. Davis considered both to be unacceptable. Of course, these charges were vehemently denied by union officials during a special news conference, where representatives from the drivers' union; the salaried workers' union; the mechanics' union; and other department locals were in attendance. Kerchel Schwartz, president of the bus drivers' union, said the "statements made by Davis about the drivers are lies," while the head of AFSCME Council 77, Lloyd Simpson, even threatened a work stoppage, and demanded that Mayor Gribbs remove Davis from his position. Although Davis was never released form his duties — which, no doubt, would have been an unwise political move for the mayor at that time in the city's history — Davis, for the most part, would maintain a low media profile through the remainder of his term. He did, however, manage to see the department through its financial crisis, and was still in charge during negotiations held in 1973 to sell the DSR to the Southeastern Michigan Transportation Authority (SEMTA). Davis would remain on as DSR general manager through the end of the Roman S. Gribbs administration. He resigned shortly after Coleman A. Young was sworn in as mayor in January, 1974. That following July, under a newly revised city charter, the DSR would become the Detroit Department of Transportation (D-DOT). Chrysler-Plymouth-Imperial dealership located on Dexter at Elmhurst in Detroit. usher in the department's 50th Anniversary. slogan.... "Come Ride With Us!" Over the next twenty years, Ed Davis would publish his memoirs and serve as a consultant to minority auto dealers and other African-American business owners. 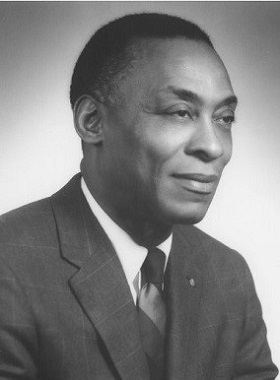 Although he would continue to receive honors during his remaining years for his numerous accomplishments in the auto industry — including being the first African-American inducted into the Automotive Hall of Fame in 1996 — not much has been mentioned regarding his appointment as head of Detroit's ailing public transit system. A once proud system that had been on a decline many years prior to the arrival of Ed Davis and would unfortunately continue on that decline for many decades to come. Edward "Ed" Davis would pass away due to congestive heart failure on May 3, 1999, at the age of eighty-eight. for keeping the book so long, but it was worth the time. 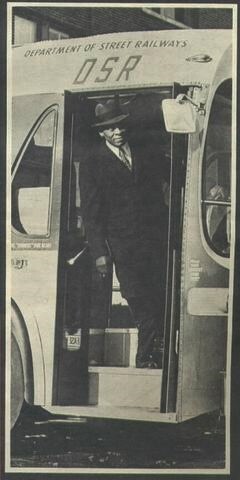 the February 6, 1972 edition of the Detroit Free Press "Detroit Magazine" article titled, "Ed Davis: The Idealist in the Driver's Seat of the Creaky Old DSR,"
sources, including the online web-site Answers.com: Ed Davis. Click here to return to the "AROUND OLD DETROIT" Main Page. and around the City of Detroit. Born in Shreveport, Louisiana on February 27, 1911, Edward Davis was the oldest of ten children. Although his mother passed when he was ten, his father — who was a food jobber — owned his own business, which enabled him to earn enough money to feed, house and clothe his family comfortably. His father also owned a 500-acre farm located about sixty miles from town. As a youngster, Davis became fascinated with the inner workings of his father's Model-T Ford, which helped to spark his interest in and love for cars. At the age of fifteen, Davis convinced his father to allow him to move to Detroit, to live with an aunt, where he could get a better education than what was offered in the poor black schools in Shreveport. In Detroit schools he could also combine his love of cars with a solid business training. He would attend the prestigious Cass Technical High School, where he initially considered a career in accounting. However, Davis became discouraged after discovering that the accounting field offered little opportunities for blacks, and instead turned his focus toward his first love; the automobile. To learn more about the automobile business he took a part-time job in a car-repair garage during his last year at Cass, working for no pay beyond his 12¢ round-trip streetcar fare. After several weeks he was paid more than transportation money, and eventually worked his way up to $12.00 per week. However, the Depression of the 1930s would result in the loss of his job. In 1934, Davis was able to start his own business by renting a car wash business in a gas station. This was after convincing the owner to allow him to offer this service in his station. Davis' big break would come after one of his car wash customers, a Mr. Lampkins, offered him a job in the foundry at the Dodge Brothers main assembly plant in Hamtramck, an enclave of Detroit. After having worked there a few weeks, Lampkins — a superintendent at the plant — arranged for Davis to be shifted from the foundry to a better job in the machine shop. After having recognized Davis' great love for cars, along with his winning manner, Mr. Lampkins would later offer him a job as a new car salesman — on a part-time basis — at the new auto dealership he had just arranged for his son. In 1936, Ed Davis began his first car salesman job at the Merton L. Lampkins Chrysler-Plymouth dealership, located at 16330 Woodward Avenue, in a "high income area" of Highland Park, another Detroit enclave. Unfortunately, discrimination was an everyday factor of life back in those days, and being black, Davis found himself shunned by his white coworkers. He was not allowed to work on the main showroom floor with the white salesmen, but was required to work out of a secluded makeshift office in the dealership's second floor stockroom. However, Davis was able to use this discrimination to his advantage. He redesigned the storeroom into a "private office" where he brought in his own desk and office furnishings. Since he had to solicit customers on his own, he didn't have to spend time with those who only visited the dealership to browse around. Instead, he was forced to get out into the black community on his own to sell cars. But despite the odds, Davis was able to establish a growing clientele of loyal customers, and eventually went on to sell more cars than any of the dealership's white salesmen. Many from the city's black community heard about "the black man who sold Chryslers." Davis became so successful at his job he was eventually promoted to full-time salesman, but turned down an offer to give up his office and work on the floor with the others. Meanwhile, hostility toward him from among the sales-staff grew, even to the point of a physical confrontation with a coworker. In 1938, Ed Davis decided he was ready to open his own auto dealership. On December 4, 1939, Davis Motor Sales — a used-car lot — opened for business out of a former plumbing supply building located at 421 East Vernor Highway, which today would be located on the Fisher (I-75) Freeway at Brush Street. His dealership was located in the city's predominately African-American "Paradise Valley" community, a few blocks north of Detroit's downtown business and shopping district. Although the used-car lot sold all makes of cars, and business was good, Davis' main desire was to sell new cars. However, he did continue on as a new car broker for black customers, and even without a new-car dealership of his own, he was still able to sell a large volume of new cars. He would later open a Standard Oil gasoline station next door to his dealership. 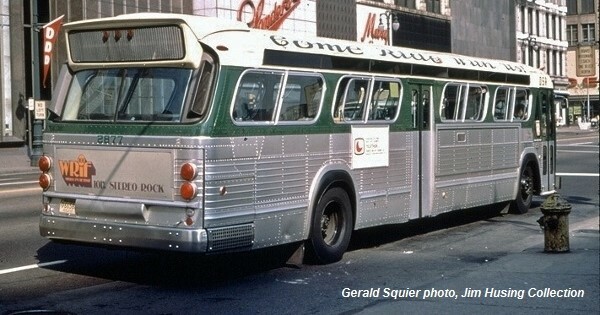 Davis would head the Detroit bus system. owned by an African-American. It was located at 421 E. Vernor at Brush Street near downtown Detroit. Meanwhile, it was during this same period that the South Bend, Indiana based Studebaker Corporation had been struggling to sell cars in Detroit. After hearing word about the successful Ed Davis, the company brass decided that Davis might be the way to reach the city's black population, which could offer tremendous potential for sales. In 1940, the company offered Davis a Studebaker franchise. Davis decided to accept the offer. Although no bank would grant him a loan, he risked his entire savings, and was able to obtain the $10,000 needed to open the franchise. 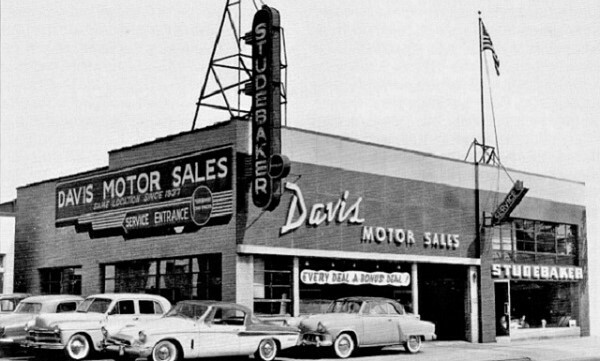 Davis would remodel his building, and would soon be in business selling new Studebakers. With the opening of his Studebaker dealership in July of 1940, Ed Davis would become the third African-American to be awarded a new-car franchise in the United States. He would later be elected president of the Studebaker Dealers Association of Detroit. Interestingly, when Davis opened his Studebaker dealership in 1940, only two blacks in Detroit owned a Studebaker automobile. So initially, sixty percent of his business came from white customers. But this would drastically change after the violent Detroit race riots erupted during the summer of 1943. From that point onward, Davis Motor Sales would depend almost entirely upon its black customers, as service traffic from white customers dropped off after the riots. However, after gasoline rationing and new car restrictions were lifted after WW-II, the demand for new cars skyrocketed. Studebaker's share of the Detroit market more than doubled and business for Davis was good. He even had to expand his facilities. However, by 1953, stiff competition and price cutting from among the "Big Three" would result in major market sales loses and profit declines for Studebaker — with the automaker facing possible bankruptcy. On October 1, 1954, the Studebaker Corp. was acquired by the Detroit based Packard Motor Car Co. The newly merged company would become known as the Studebaker-Packard Corporation. But unfortunately, Studebaker's auto sales plummeted after its 1955 models were introduced. After assurances were made to Ed Davis by representatives from General Motors, Ford and Chrysler of acquiring a possible new-car dealership with one of the Big Three, he decided to drop his Studebaker franchise in April, 1956. In June of 1956, a Plymouth-DeSoto franchise promise fell apart after other Detroit dealers feared they would lose all of their black business if Davis was granted a dealership. After promised franchise offers never materialized, Davis has to settle for being a sub-dealer for a local Ford dealer, on the promise of an opportunity of a Ford franchise whenever the territory around him became available. Davis then became associated with Floyd Rice Ford — one of Ford's largest Detroit dealers — and was made a vice-president in the firm. He could sell cars as a sub-dealer through their downtown dealership, located at 100 West Vernor, just five blocks west from Davis Auto Sales. However, after Floyd Rice later closed its downtown location in early 1958, Davis was never offered a Ford franchise. He attempted to continue on at the Floyd Rice main dealership on Livernois Avenue at Doris — along Detroit's "Automobile Row." But racial prejudice and anger from the sales staff at that location made things unbearable, and in order to keep the peace, his arrangement with the Floyd Rice agency was ended. The major portion of Ed Davis' business would once again return to primarily selling used cars. But this time his auto business would suffer another financial blow, after it was announced that his property was in the path of a proposed new Detroit expressway. By 1959, most of the area surrounding his business had now been condemned and slated for urban renewal development. The entire area was deteriorating, both physically and economically. Eventually, construction on the Fisher (I-75) Expressway in Detroit — which tore through E. Vernor street and much of that lower east-side black community — would force him to close his business. In 1962, the federal government would pay him only $75,000 for his property. 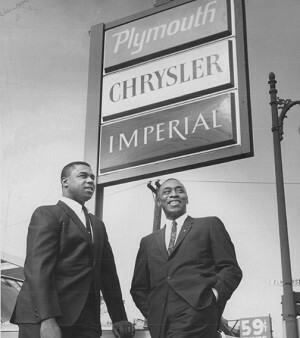 Finally, on November 11, 1963, Ed Davis was able to secure a new-car franchise with Chrysler-Plymouth — making him the first African-American to be awarded a "Big Three" auto franchise. 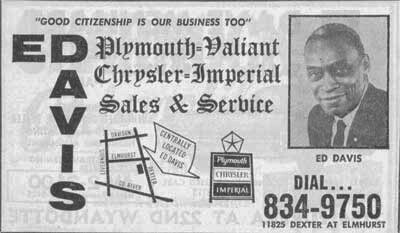 His Ed Davis, Inc., Plymouth-Chrysler-Imperial Dealership (Dealer Number 62399) was located in a predominately black middle-class neighborhood, at 11825 Dexter Avenue at Elmhurst, on the city's west-side. The Davis dealership prospered immediately and had to be enlarged within its first few years. It grew to become one of Chrysler Corporation's most aggressive dealerships, selling an average of 1,000 new cars and twice that figure in used cars a year. But by the time of the 1967 Detroit riots, the neighborhood surrounding his dealership had changed from middle class to one of the toughest on the city's west side. Davis soon found theft from his lot an impossible problem, as was also the inability to obtain insurance. Requests by Davis in 1968 to relocate his business to the city's northwest section — where the black middle-class was headed — were denied after Chrysler was unwilling to undertake such a project. After his employees and salesmen unionized in 1969, and the ongoing union labor problems that followed, Ed Davis decided to close his dealership after thirty-plus years in the automobile business. Later, Davis was quoted as saying, "Finally, it reached the point where it wasn't worth it anymore." On February 26, 1971, Ed Davis retired, and closed the doors to his auto dealership business. at 11825 Dexter Avenue at Elmhurst (southwest corner). top photo is from a Yellow-Pages phone book advertisement. 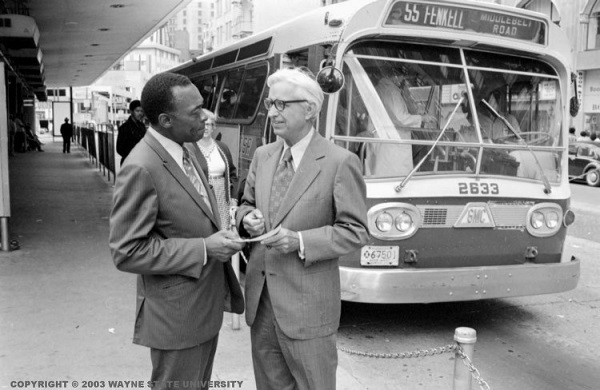 On October 1, 1971, Detroit Mayor Roman S. Gribbs appointed Ed Davis as new general manager of the Department of Street Railways (DSR), replacing Ernest W. Knox who was retiring. At the time, Gribbs had been looking for a prominent black to join his administration. It was hoped that Davis might discover some innovative ways to improve service at the problem-plagued, money-losing transit agency. Davis later stated that he took the job as a challenge, and wanted to improve the system. When Davis took over in October of 1971, the DSR operated 1,100 buses, employed 2,380 people, and generated more than $200,000 from the fare box a day, or some $150 million a year. But despite those numbers, the department had lost money every year since 1966, at the rate of more than $9 million a year, and that despite two fare increases. Not long after arriving at the DSR, Davis concluded that "...the DSR had become a sloppily managed organization," and it didn't take long to discover the "deplorable morale of the operation." He was appalled at the lackadaisical attitude of some DSR people, and their lack of enthusiasm for their jobs. The morale problem became even more evident in the attitude of the coach operators. ""I asked if they had taken a bus to work that day; they said none of them had. "The service is so bad," they explained, "we wouldn't ride the bus." "Thank you, gentlemen," I said, smiled, and turned around. A Detroit Free Press reporter was standing behind me, and turning to him, I remarked, "If someone had said something so negative to me about my auto dealership, that man wouldn't have lasted long as an employee." That's all I said, and I just walked away." Although Ed Davis inherited the problems facing the financially troubled and debt ridden bus system when he took over at the helm, Davis was still determined that he could "sell" the public on DSR service, just as he had sold them Chryslers and Plymouths. service. The new buses displayed the new DSR slogan, "Come Ride With Us!" above the standee windows. Virtual Motor City Collection photo #37057_1, used by permission of the Walter P. Reuther Library, Wayne State University. reproductions may be protected by U.S. copyright law (U.S. Title 17). The user is fully responsible for copyright infringement. soon be purchased by the regional Southeastern Michigan Transportation Authority (SEMTA).